Do you have what it takes? Do you seek the thrill of victory? Do you dare to step onto the court? 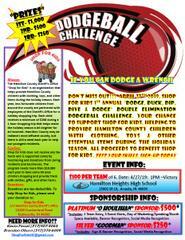 If so, the gauntlet has been thrown down to enter the Hamilton County Sheriff’s Office Shop for Kids Dodge, Duck, and Dip Dodgeball Challenge on April 27, 2019 at Hamilton Heights High School. The double elimination tournament will test the skills of all those who dare to enter while supporting a worthwhile cause – providing support for the less-fortunate youth of Hamilton County. Shop for Kids provides numerous area youth who are in need of assistance a $200 shopping trip during the holiday season. To fund the $10,000 needed to finance the program, support is raised throughout the year. The funds then go to provide children with toys, clothes, and other items to make the holiday season a bit brighter for those who may not have enough. Even in Hamilton County, there are always those who need an extra hand. Entry fee for the Shop for Kids Dodgeball Challenge is $100 for a team of six (6) with special sponsorships at the $250 and $500 levels. Create your own weird and wacky team or come as you are. The tournament is double elimination with prize money for the top three (3) teams. Form a team and sign up early for plenty of practice time before the April 27 tournament at Hamilton Heights High School. For more information contact ShopforKidsHC@gmail.com.